The year is 2027 and a new energy drink called Overdrive has turned the citizens of Sunset City into crazed mutants. The game plays out as a action packed 3rd person shooter with crazy movement. You grind on rails and bounce off of tree tops and skim over the water. The game is based on moving fast equals staying alive. You not only have to contend with the mutant hordes but also scabs, human criminals who are using the mutant scare to try to take over the city for themselves. There’s a mutant apocalypse coming can’t we all just get along? The story is extremely funny and heavily self-aware. In one of the early missions you get a status update from a NPC back at the base and the NPC with you asks how you are communicating with the base. Your character scolds them for questioning something that is there just to move the story along. The general plot of the story is you are trying to escape Sunset City so you can tell the world what Fizzle Co is up to. In a welcome twist to the evil corporation trying to take over the world standard, here it was just a sad accident that the drink is destroying Sunset City. There was no malicious intent here, mutants don’t carry a lot of pocket change and make many energy drink purchases so it’s detrimental to the bottom line all this mutant business. But since it did unfortunately happen, Fizzle Co is also not really interested in taking the fall for it either. The campaign is not particularly long and consists of 27 main missions that can be done in less than 7 hours time. So if you are a Point A to Point B and only play a game’s campaign type of player then the content level is certainly lacking. But if you are a Open World player of the highest of caliber and love the search for Side Missions and various Challenges then that time will more than double. Challenges consist of speed traveling, killing things in certain way and a ton of other stuff. Lots of variety. Add in an insane number of Collectibles and there is quite a bit to do in Sunset Overdrive. Traversing the city is very smooth. Moving from grinding a rail to bouncing off some building awnings to hanging from some power lines is quick and smooth. My one issue with movement is there is a system of poles you can swing around to get a speed boost that almost never ever ever with my character grab them. They really are not needed but a lot of them have hanging collectibles and the range and perfection you need to grab these is a little insane. But that really is the only issue I had with movement. Sunset Overdrive really nailed the movement, from being able to reverse to changing from top riding or bottom hanging positions based on if you are trying to dodge incoming fire. Combat in Sunset Overdrive is 3rd person shooter with a auto-aim system. You can manually aim if you want but you are typically grinding so fast that manual aiming is an exercise in futility. The game is based on speed so use it to your advantage. There are a ton of crazy guns to find and buy. Ranging for TNT Teddy Bear launchers to bowling ball launchers to flaming shotguns. As you use each weapon you can level it up for more damage and more ammo up to level 5. Leveling up your gun is just stage 1. On top of the weapons you are also working towards getting AMPs. AMPs are bought by getting the collectibles in the game and do things like add fire damage or stun damage all the way up to each time you jump on a bounce area the whole area below that is a mini bomb. These things get crazy fast and they have levels also. But that’s not all. You also can earn badges for grinding and getting kills with weapon types. These badges are combined to form Overdrives. Overdrive are bonuses like carry more single shot ammo or do more damage to this enemy type. You can really make your life a LOT easier by making sure to have the right AMP and Overdrive combo for the situation. If you want to get into the nitty gritty of the system there is a lot you can do, if you just want to get some bat crazy effects going then that is definitely an option also. Collectibles. Normally I would rage against a game that sports over 600 collectibles but Sunset Drive does two things that tones my rage down quite a few notches. Firstly, you can buy maps for all the collectibles in game and see exactly where everything is making it a lot easier. Secondly they are not just achievement guide selling collectibles. You actually use these items in game to upgrade and make your AMPs so they have a purpose. 600 is still insane and it definitely will add quite a few hours to your gameplay of just nothing but running around the map but at least they just aren’t there to sell strategy guides. The multiplayer is co-op with a competitive side. Although all 8 players are working towards the same goal, each player is scored individually. The missions are extremely varied from simple kill missions to item to retrieval to defense missions. There is a standard map voting at the end of each round and then you all run to the next part of the map for the next missions. The game can get quite crazy with 8 people shooting a million pyrotechnic guns in a small area but the game never showed any sign of slowing down or lag which was a welcome change from normal online play for most games. For a game that is so self-aware you need to actually activate mutliplayer (Chaos) from within the single player. So if you want to do some co-op you first have to load in the game and make your way to one of the Chaos portals. Nothing too crazy but an annoyance if all you want to do is get your multiplayer on. 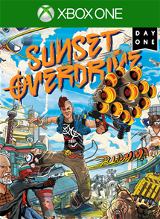 I had, and am still having, a blast playing Sunset Overdrive. It’s definitely over the top in almost everything it does, which can be off-putting to some people, but I find it an amazing game. Once you get some of the higher end AMPs and the craziest of the crazy guns the game really takes off and looks just amazing with bright colors and over the top explosions. Insomniac has made one of the top games on Xbox ONE.